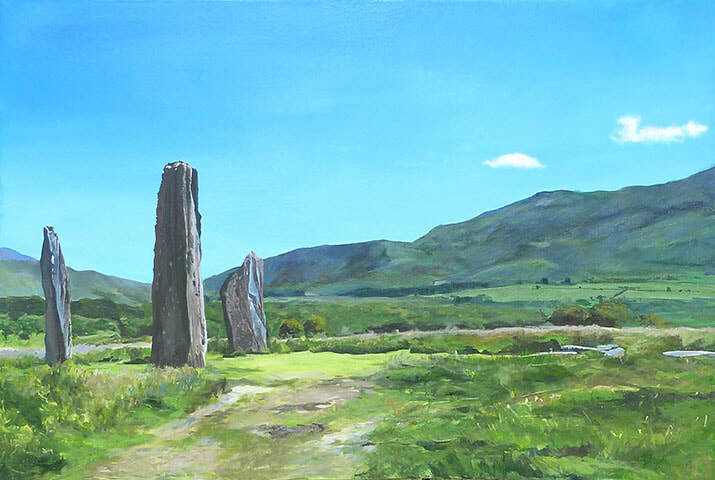 A Sunny holiday in Scotland is quite a rarity and so the sun beaming down on the Machrie Moor stone circles on the Isle of Arran, is something worth capturing. Here is the result, gleaned from a broad selection of photographs that we took, the resultant image shows the impressive stones dominating the landscape. I started with a base coat of areas filled in like colour by numbers and then added more expressive layers. Finally, I detailed the stones and made them the most defined part of the image, hopefully adding to their “supernatural presence”.